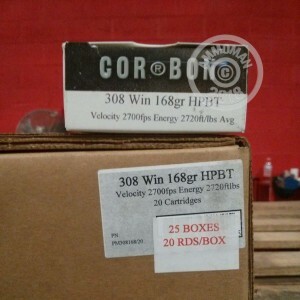 This Corbon 308 Winchester ammunition is perfect for your high precision range training and match shooting. Each round is loaded with a 168 grain hollow point boat tail bullet. This bullet is not recommended for hunting, as it might not expand like purpose made hunting hollow points. The boat tail design of this round improves long range accuracy and precision by reduces in the effects of wind and yaw whilst in flight. Each round uses Boxer primed brass, and is reloadable. Muzzle velocity is approximately 2700 fps.